Former Offaly star and current RTE pundit Michael Duignan has called on every hurler in the county to make themselves available in 2014 for the new management team headed by the ‘Millennium Man’, Brian Whelahan. 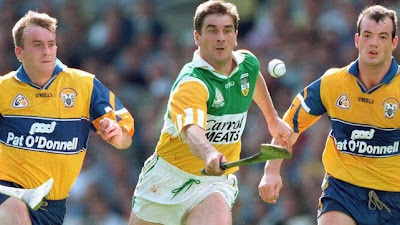 The 1998 All-Star believes former boss Ollie Baker never had the luxury of having a full panel available to him for one reason or another but that every hurler in Offaly should commit to the cause and has stated “If you’re not picked for a match just take it on the chin, come back and fight for your place”. He insists they should “have that bit of pride about yourself” and also encouraged the Offaly footballers to do the same. Duignan, who played both codes for his county, has welcomed the prospect of potential dual stars in 2014 but has warned that there is a huge difference in being a casual club footballer to going to play for your county, something he learned first hand. The former St Rynagh’s hurler and two times All-Ireland medal winner has dismissed the notion that Offaly’s hurlers are not fit enough and said the squad are simply “going through the motions of being county players” without being ruthless enough to take it to the next level. In this exclusive interview with the Offaly Topic, Duignan also discusses his views on the Go-Games policy, his time playing rugby, his relationship with former managers Eamon Cregan and Babs Keating as well as his admiration for his club mate and former Offaly captain, Martin Hanamy. Michael, who was your earliest influence in hurling? “Starting off in Banagher you had men like Tony Reddin, the great Tipperary goalie who was named on the team of the century and the team of the millennium. As I got older I realised it was great to have a neighbour like him with his pedigree. There were men like Tommy Fogarty, Aidan’s father, Roy Mannion, Shane McGuckin, David Hughes, Hubert Rigney and Martin Hanamy. Then of course there was Pádraig Horan who was the first Offaly captain to win the All-Ireland and Damian Martin who was the first ever All-Star goalie. It just became part of your life without you really knowing what was going on and only then you start to realise the people around you and you start to learn the history of the club and become really interested in the club. I don’t remember ever not having a hurl in my hand really. When you came home from school it was straight up to the field until it was dark. Rynagh’s were going so well in the ‘70’s and 80’s and then Offaly made the breakthrough so I was blessed really with the timing of it and with Rynagh’s having great pedigree and all these great players”. What did you achieve at underage level? “Looking back now I suppose I did win a good bit. At school’s level there wasn’t much training it was basically ran from the clubs but our great rivalry with Birr would have started off around then. They would have had great players like Declan Pilkington, Gary Cahill, Joe Errity, Daithi Regan and although Brian Whelahan and Johnny Pilkington were a bit younger it wasn’t long until they came on the scene. We had a great rivalry through National school. The Feile started in the ‘70’s and I won four of them. People thought of Rynagh’s as a big club but there’s no way at ten and eleven that I should have been good enough to be on all them teams and truthfully I wasn’t good enough. I was corner back on the first team and full back on the second team but it was more pulling and dragging than skill! I think these days it’s really only when lads are on their last year of an age group that they make it or maybe their second last if they’re really good. For some reason we mustn’t have had the numbers. It was a great experience playing in them tournaments. We played in Mooncoin in ’79, in Sarsfield in Galway in ’80, Craughwell in ’81 and Vincent’s in ’82. I’ll always remember the tournament in Mooncoin because Roy Mannion and I were staying with our host family, the Murphy’s. They had two sons named Tom and Joe and when Offaly won the Leinster minor final in 1986 Roy was full back for Offaly and I was full forward and the two Murphy’s were marking us. It was some coincidence! I won one U16 then and a minor on my last year. It just showed how fierce the competition was because Birr and Kilcormac/Kiloughey were very strong and Coolderry weren’t far off either. I finished up with four U21’s then”. Is there too much emphasis on winning at underage level? Are you in favour of the Go-Games policy? “I am now. When I was a young lad that’s all I knew and we were all very competitive but looking at it now that I’m involved with underage teams I certainly am a fan of it. What I’ve noticed is that it is keeping young lads playing. It’s alright for the really big strong lads if you have the competitive thing and they’ll shine and move on but you lose a host of players who aren’t getting game time. Even if they are getting game time it mightn’t matter because they’re isolated and it’s all about the three or four strong players. Maybe that’s alright for the big clubs because even if you lose lads there’ll always be more coming along but for smaller clubs it’s important to help every player develop. I know there comes a time when you want to start winning things and picking your best team but at that age kids should be going home with a smile on their face and parents should be happy that their kids are playing sports. You should be trying to create a safe environment where people come to enjoy themselves, improve their skills and that they want to come back. Long term of course not every child will go on to be a player but it’s important to keep people involved in the club and they can go on to do something else like administration. When I was a player I never noticed what went on in the background but it’s amazing now when you see it first hand. As a player you just think about yourself really but you never notice the person marking out the pitch, or the person washing the jerseys, or the chairperson or secretaries. That’s all part of what makes up the GAA family and if the Go-Games can keep more people involved it’s all for the better”. Who was the best player you played with at county level? “I have two players really at county level. I mean Brian Whelahan on his best day was just incredible. If you look at anything we won or any big matches we played in over the years he was generally the key man. He had such a massive influence. What I loved about Brian was that he was a team man. He could have just marked his own man but he didn’t, he covered for everybody. Sometimes he ignored his own man and just went for everything because he had such confidence. I would probably put Johnny Dooley up on the same level. He had everything from pure hurling, balance, skill, temperament and bravery. He had no weakness in his game and in ways he was probably more consistent than Brian. Johnny Pilkington was another great player and of course Martin Hanamy. You could name any amount of lads really but they are the lads I’d have in the top four. Martin was a clubman of mine and just to be able to see his attitude and determination it was phenomenal. When I first came on the scene with Offaly I got to play with Joachim (Kelly), Joe Dooley, Ger and Eugene Coughlan and that is something I really loved. Joachim was such an inspiration to everyone around him. Everything was always so positive with him it was like Roy of the Rovers stuff. He had you believing you were going to win every match, every All-Ireland and he played like that. Off the field he was excellent too. He really welcomed the new breed of players into the squad and has a great attitude towards everyone”. Who was the best player you played with at club level? “I played with Pádraig Horan and Damian Martin before they retired and also Hubert Rigney. They were all tough no nonsense hurlers and I suppose that’s what Rynagh’s was all about to a large extent. It wasn’t flashy but there was great players in the club. Micháel Connelly won us a championship with his free taking and he had this persona of a mad man with his long hair but he wasn’t like that all. He’s a very quiet family man in fact. Martin Hanamy as a club man and an Offaly man and even as a person his attitude and determination were unbelievable. He was such a professional and just way ahead of his time. He was captain in 1994 and then went away from it in ’95 and with no criticism towards Johnny who took over, but I think Hanamy had such a high level of influence. I think the aftermath of ’94 with all the celebrations of going here there and everywhere with the cup just really didn’t suit Martin because that’s not his style. Anthony Daly was Clare captain throughout his career nearly and you see now that more counties are sticking with the one captain and I really think Martin should have been our captain because he had all the attributes. He was the one that everyone looked up to”. “It’s a really difficult one to answer. I would have struggled for a while always thinking that the person I’m marking is better than me. Two weeks before the match I would always spend the first week worrying about marking such a fella but on the second week I’d just say forget him I’ll get the better of him. When I was starting off John Taylor of Laois was a massive player. Georgie O’Connor or Larry O’Gorman of Wexford or the great Clare back line of the ‘90’s where it didn’t matter which of them picked you up, Anthony Daly, Liam Doyle, Seanie McMahon or Brian Lohan. Maybe Willie O’Connor of Kilkenny was the best of them but you also had Wayne Sherlcok and Sean Óg Hailpin of Cork. To be honest, at club level things were just as hard even in training trying to mark Shane McGuckin or Martin Hanamy because they treated it like an All-Ireland final. Shane had a great attitude. Kevin Martin or Kevin Kinihan were the same at Offaly training. I got to a stage where I wasn’t really concerned about who I was marking I just worried about getting myself right. I had great regard for everyone I played on but it got to the point I didn’t really care and I actually enjoyed marking them. Mick Coughlan from Clareen was probably the best club player I ever played against"
What was your proudest moment with Offaly? “My favourite match was probably the 1995 Leinster final because we were written off but maybe because we lost the All-Ireland final afterwards it lost some significance but that was a great day. The rain that fell that day was unbelievable. I watched it recently and perhaps it wasn’t as great of a game as I first thought but the passion that Offaly played with was amazing. I think with the benefit of fifteen years looking back now the game against Clare in Thurles was right up there. We felt going into the ’95 Leinster final we weren’t getting the respect we deserved after winning the All-Ireland the year before and then with the Clare game after everything that had gone on during the year and the atmosphere in Thurles that day. I think a lot of people forget that Offaly done all of their hurling in Croke Park and didn’t really play anywhere else. We played one match in Mullingar and one in Thurles in my career. To cap everything off we went on to win the All-Ireland after everything that had gone on, the Babs thing, Thurles and beating Kilkenny in the final. In hindsight the ’98 win just about tops the other two. Apart from football, what other sports did you play? “I went to boarding school in Ballinasloe and was introduced to rugby. I played with Connaught schools and won a couple of Connaught senior colleges. I won a Connaught senior cup medal with Ballinasloe, the All-Ireland league with Buccaneers in ’97 and a Towns Cup medal with Naas in ’98. I enjoyed it at the time and made a lot of good friends through it. I probably didn’t appreciate it as much at the time or as much as the lads I was playing with but to look back on it now it is a nice thing to have done. How would you describe your relationship with Eamon Creegan? “I think with Creegan we would have had a tough time for a while. I was living in Dublin and I had a lot of injuries, a very bad ligament injury in particular and I didn’t start against Kilkenny in 1992 or ’93. Eamon Cregan was a perfectionist on the hurling pitch but he was also very tough. Physically he was a great bit of stuff. I had difficulty getting to training from Dublin because I had no car at the time and a few other things were going on and I’d say he probably start questioning my commitment to the team because when he wanted me I was injured. Starting out with Offaly things had gone well for me winning a few Leinsters and the National league but when Eamon came in we were a long way away from winning an All-Ireland. He done a lot of physical training with us and I done all the training but got injured, missed the first match and we got beaten and knocked out of the championship. The same again in 1993 beaten in the first round and I was sitting in the dugout wrapped up like a mummy. I was actually brought on in one of them games and truthfully I shouldn’t have been. I think it was the day John Troy made his debut and I was brought after about fourteen minutes but I was taken back off after thirty five minutes. I had even sat in the corner of the dugout whereas normally you’d be sitting right beside the manager hoping he’d notice you. We probably had one or two arguments but we straightened a few things out. In 1994 I was going well and I played in the Leinster final against Wexford but after about five minutes I damaged the ligaments again. I played on but I couldn’t start the All-Ireland semi final. I came on with ten or fifteen minutes to go and scored a point but I missed two easier scores. 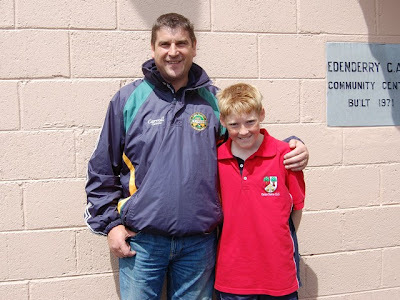 I couldn’t train for ten days after that so Eamon came to me before the final and said I’d missed a lot of hurling and that I done well when I came on the last day so he would hold me in reserve. For years and years I’d being trying to get to the final and I felt I deserved to start and so did most of the players. Over the course of that winter I was determined to get my injuries sorted and I did and I went on to enjoy a good relationship with Eamon after that. I really got to know him and he’s a solid straight man. We probably should have won more under him. I think had we being going for three in a row in 1996 we would have beaten Wexford but we were probably a bit to lax". "Babs was very much a larger than life character. I knew some of the Tipperary lads that had trained under him and we’d heard different stories about him. He was very much a pro player’s type of man and to be totally fair to him he insisted on looking after them whether it was with hurls or meals. There was a good buzz around but slowly things started to decline. Our physical trainer Johnny Murray was great but when it came to the hurling it just wasn’t our type of style. Babs was into using your strength and holding up the ball, a real Munster style of hurling. Whether he couldn’t get it through to us or whether we didn’t want to learn it, it just proved difficult and coming into the summer we were still doing heavy slogging and hadn’t stepped up the hurling. We scraped over Wexford with a last minute goal from Johnny Dooley and while we started well in the Leinster final DJ Carey got two late goals and we were beaten. Babs came out with the outburst then and I was largely unaware of it. When Michael Bond came in then and when the dust settled the players realised the pressure was on them now to perform and that the finger was being pointed at us. It was unfortunate really but I don’t think we would have won the All-Ireland had he stayed in charge. At the same time I’d have nothing negative to say about him I still get on well with him to this day and travelled to training with him regularly”. What did you make of Offaly under Ollie Baker over the past two years? “What seems to stand out over the last few years is that we get to a certain level but then we can’t get over the line. If you take the Galway matches over the last few years, the Cork match in Cork, the Waterford game last year playing with the wind at home with twenty minutes to go and then getting beaten by eight points. If you’re not in the set up I suppose you don’t really know but there is a weakness there. To me that’s a mental deficiency. Some people think they’re not fit but I think that’s an easy target. Telling committees that a team isn’t fit but you’ll change that is a great way to get a job but you’re still not getting to the root of the problem. The underlying problem for me is that there is a lack of belief. I’ve been reading what Brian said in his interviews so far and I was thinking that’s exactly what I would have said. I don’t think there’s anything wrong with our hurlers we have plenty of good players and big men but we’re not winning ball in the air. We have six big forwards but yet we never win a puck out. Has that been looked at or is that being addressed? It’s easy to blame a set up or pick faults within a set up but I know Mike McNamara and Joe Dooley put in serious effort as I’m sure Ollie Baker did too. To me I think they’re going through the motions of being county players without really moving to the next level or wondering what does it take to bridge that gap. It takes a fair degree of mental strength, ignorance, determination and a will to win. You have to be ruthless and I think there is a bit of that lacking really. From year to year I think they’re just doing their training and getting on with it but not fully committing to the whole cause and believing they’re going to win something. A couple of heavy defeats by that great Kilkenny team over the years probably didn’t help matters”. There has been plenty of talk regarding potential dual players in 2014. Do you think that can work? “It can work for a while if the will is really there but it’ll take a huge commitment. It’s very time consuming. To play at the top level of sport you need to be playing it all the time and maybe you can slot into football a bit easier than you could hurling but I do think it can be done if lads are genuinely good enough. I don’t know how many of these lads are genuinely good enough to be top class hurlers and footballers so that’s up to the managements to assess. I read last week that Aidan Walsh of Cork is planning to do both next year and he is a top class hurler and he’s definitely good enough to play for Cork. There’s a big difference in a lad who plays a bit of club football being good enough to make it at county. I know myself because I done it and I saw the gap. It’s massive and Offaly weren’t even exactly at a high level at that time. It’s very difficult to go from being a casual club footballer which I was at the time to going to play for your county. I see nothing wrong with given lads the chance to do it though if it can be facilitated all well and good”. What did you make of Brian Whelahan’s appointment as the new Offaly manager? “I was in the running myself at one stage but the timing wasn’t right and I couldn’t commit to it but I was delighted when Brian got it. I was actually a bit surprised at first because I knew he was taking the minor job and I knew Paschal had taken the minor football job and I would be very passionate about them teams going in the right direction. If we don’t improve there then it doesn’t matter what we’re doing at senior. We need to be competing for Leinster minor titles. If you’re over a senior team you shouldn’t have to be teaching lads how do anything really you should be just polishing them off and working on tactics. A lot of what is happening is managers are now having to spend two or three years at senior level getting lads to where they should already be. I was excited about him getting the minor job but when I stepped back and looked at it I said look, he’s a legend of the game and has a huge knowledge of the game. His backroom team is very good with Ger Coughlan and John Troy. They are very good deep thinkers of the game and Brian’s initial comments and response have being very measured and very accurate of what needs to be done. I think it’s great to have one of our own in the job because there are plenty of people good enough from Offaly. It’s a very exciting appointment and I just hope every hurler in Offaly commits and puts themselves forward to play for the county. To be fair to Ollie Daly the amount of lads that were unavailable last year was unbelievable. If you’re not picked for a match just take it on the chin, come back and fight for your place. The same goes for the footballers. You should have that bit of pride about yourself. If you’re going to play hurling or football then your aim should be to do so at the highest level”. Are financial resources becoming a major issue for counties like Offaly? “Brian has to be given the resources to put his backroom team in place. It’s a huge issue I have with the GAA because the likes of Cork and Kilkenny have huge resources. It’s supposed to be an amateur organisation but it isn’t. You have one county spending one million a year preparing their team while we have to prepare two teams with a few hundred thousand. I just hope the management gets the resources it needs. There are so many players now in college with players from other counties and they see how they’re being treated and you have to react that. You have to get players to buy into what you have so we need to move with the times but at the same time the players have to respond to that and commit 100%”. Do you think Kilkenny will recover next year or has there been a shift in power? “I genuinely think Cork will be stronger next year and then of course Dublin are looking very good too. Wexford will look at their game with Dublin and think they could have or should have beaten them so they’ll take heart from that too. Kilkenny will always churn out great players but when the legs go, the legs go. There’s nothing you can do to prevent that unfortunately”.